Chicken pot pie is one of the first things I make when the weather starts getting cooler. This past week gave me the opportunity to go for it! 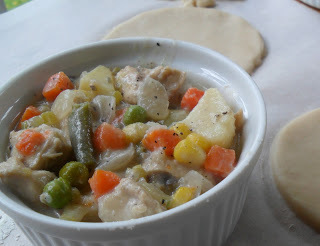 Chicken pot pie is easy to make, just chicken and vegetables with a thickened sauce and topped with your favorite crust. Like this recipe, most times my crust is a traditional pie crust but, sometimes I use puff pastry or even whipped potatoes. 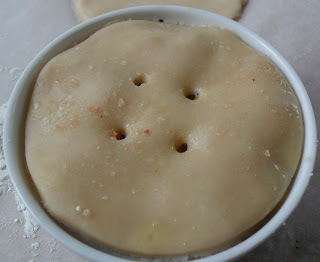 Although chicken pot pie always bring a smile, I decided to make these even more special by making individual pot pies, complete with button tops. Eat the cute! 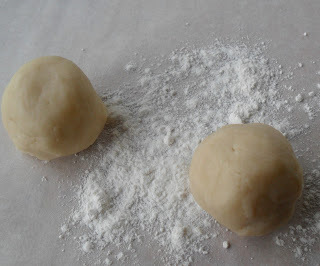 Divide dough into 6 equal balls, and roll out on floured surface. Use your baking dishes to trim each round. Fill dishes with equal amounts of pot pie filling. Sprinkle with a pinch of salt(I used my pink salt), and bake to golden & bubbly perfection! To make the filling place butter, onion, celery, and mushrooms in a large heavy skillet and cook on medium heat, stirring occasionally until softened, about 10 minutes. In the meantime, bring 1 quart of water to boil in a heavy saucepan, add frozen vegetables. When vegetables come back to a boil, cook for 5 minutes and add chopped potato. Continue to boil mixture for and additional 7 minutes. Remove from heat and drain. When onion mixture has cooked and softened, stir in cornstarch until fully incorporated and mixture is bubbly. Add chicken stock and allow mixture to come to a boil. Reduce heat to simmer and add cooked chicken and vegetables. When mixture is thicken, add half & half. Remove from heat, salt and pepper to taste. Prepare crust by mixing flour. sugar, and salt in a large bowl. Add cold butter and shortening, cutting it into the flour mixture with a pastry blender or fork. Once mixture is crumbly, add half & half, a little at a time until mixture forms a smooth, non-sticky dough. 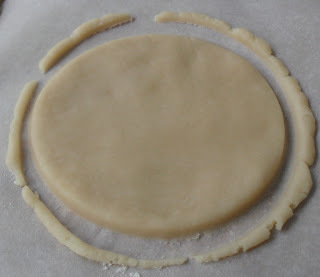 Roll out on a floured surface for 1 large pot pie or divide into 6 equal pieces and roll out for individual pot pies. If you’re making one pot pie, place filling in a deep dish 9-inch pie plate and top with rolled dough and edge as desired. Brush with egg wash and sprinkle with salt. Cut slits for steam to escape. Place pie plate on a rimmed baking sheet and bake for 40 minutes, until crust is golden brown. If you’re making individual pot pies, you’ll need 6 oven proof 6oz capacity dishes. 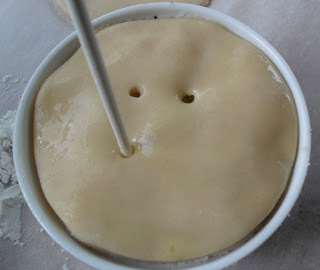 Use one of the individual pie dishes to trim dough for all 6 rounds. Divide filling among dishes and top with dough round. Brush dough with egg wash, puncture with skewer (I made a button design), sprinkle salt. Place dishes on a rimmed baking sheet, bake for 30 minutes, until crust is golden brown. 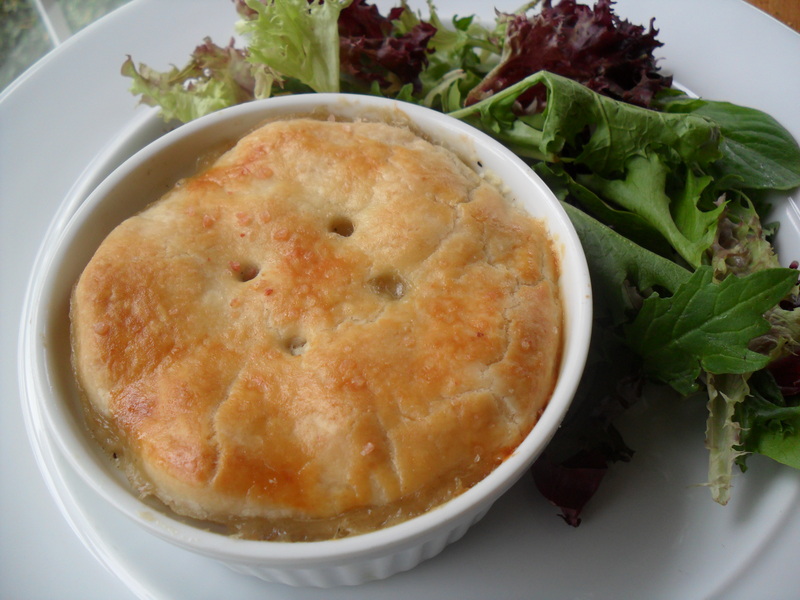 Pot pie looks delicious! One more bookmarked recipe from your blog! Dear Shawn, I need you to cater something for me sometime in my life. I’ll pay well! This chicken pot pie looks awesome!!! Aren’t they the cutest. I love chicken pot pie. Yummy, another great recipe! I love it, “eat the cute!” I was just telling Harrison that I am craving homemade chicken and dumplings. As soon as the leaves start to turn this is the kind of food I want to cook (and eat, of course). Gorgeous photos. Shawn I have never made chicken pot pie, but this looks so delicious that I hope to make it this fall/winter. My kids will enjoy it for sure and I would love it. So delicious looking!!!!!! @Jihane…You’re so sweet…Maybe we’ll swap some catering duties, because your food is delightful and I’d like to have some! @Melissa…Thanks! I saw yesterday that you’re a pot pie queen! ‘Hope your daughter is feeling better. @Angela…Thanks…Oh, how I love chicken & dumplings! @Nami…Thanks! You can easily make it your own by adding what you like to chicken, thicken the sauce and add a crust of your choosing. The pot pie looks tooo good…i remember seeing nigella lawson making a similar dish..but she used readymade puff pastry..you dish is from scratch…will try it for sure..
Girlfriend…it’s just a good thing we don’t live close to each other! haha, your pie looks delicious and mine is in the works for October, just a little final tweaking. I think we need to do a cookbook together! @Charishma…It’s delightful with puff pastry, you must try it! Also, I did try the shrimp…WONDERFUL! @Lucy…Girl, you are sooo right on everything!! !